- minor fixes to support older MacOS versions. Thank you, thank you! Whoever designed this product really knew what they were doing. I recently decided that my project over the holidays was to digitize all my family videos. I have about 150 tapes from multiple generations of video cameras and technologies- 8, Hi8 and DVC. I tried to manually digitize a couple of my most memorable tapes a couple Christmas' ago and it was a complete bear. The transfer took forever (winding/rewinding/watching/waiting), you ended up with huge files, you didn’t have any useful way to identify separate scenes from files other than to edit out separate .mov files in Quicktime. And to make it worse, you often later discoverd that the time codes on some of the tapes were not translated well and the audio was out of sync. So that adorable kindergarten performance shot was just not the same anymore. This time around the process still takes time but it is soooo much easier. Start up a tape, come back an hour later and the files have been digitized, the major scenes are broken out with thumbnail pictucres and you have the opportunity to add descriptions to both the tape as a whole as well as to write descriptions for each scene if you so choose. My wife and I received a Sony DV camera for our wedding in 1996 and pretty much used it exclusively for 12+ years until digital became affordable. Our family has many precious memories on those 50+ tapes - wedding trip, birth of kids, funerals of parents, etc. - and I’ve learned that DV tapes don’t last forever. They seem to degrade in a way that adds “confetti” to the frames. I expect in a dozen years some of them may be unviewable. Enter LifeFlix. We’re currently archiving our tapes to an 8 terabyte array (mirrored with RAID 1 for redundancy) and we’re actually enjoying the process. Our only quibble is that the software sometimes divvies up the clips for unknow reasons - one tape had an astonishing 351 “scenes” of 1 second each. 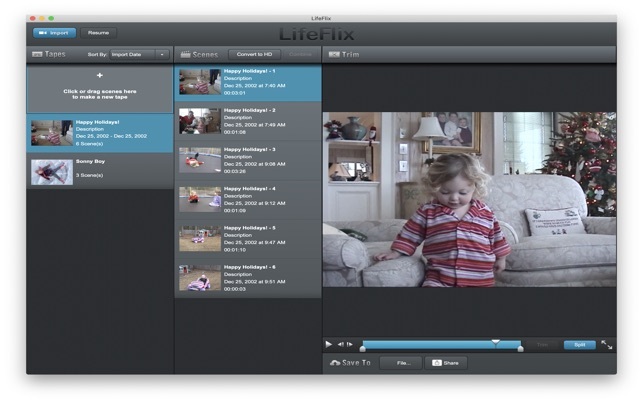 In fairness to LifeFlix, I don’t think this is their fault (the old DV tape probably lost some frames/framing info, etc). You can work around it by using the “Combine All” feature. All in all: four and a half stars (rounded up to five!) for this great app. Easy to use and great to have! I am a video professional and have been editing for 30 years. 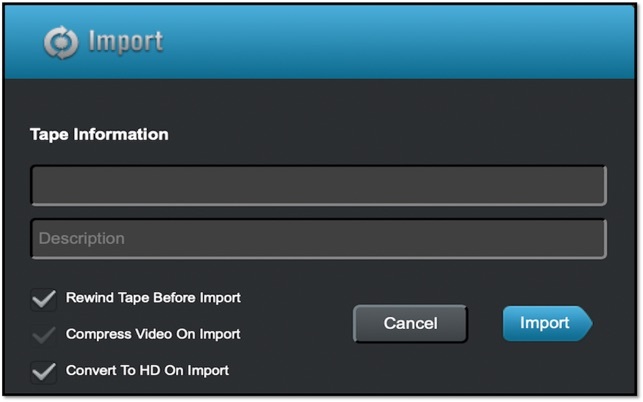 Finally a program that digitizes clips at original resolution with no loss and allows you to instantly combine all of the clips from a tape with one touch of a button. My professional edit systems don’t do this. You can, but requires editing, especially when the clips go out of sync, and way too time consuming! This is the perfect answer to saving your personal tapes in bulk with little fuss! I have over 65 tapes that I need saved and this does the job. I have only had 1 issue so far with the 10 tapes I have digitized, and that is a pretty good track record I think. I could still digitize it but not combine the whole thing, and I can live with that. It has digitized all the tapes that my professional program couldn’t so far, and I am pretty happy. Great job with this program! Look forward to updates. The cost is more than reasonable, so thanks!